Dead bait fishing can be as simple or as complicated as you want to make it and it’s perfect if you’re looking for a technique that allows you to really get inventive. Although the basic idea of offering predators a small dead fish to tempt them is straightforward enough – the clue is, after all, in the name – there’s plenty of scope for varying the way you do it and sometimes it can seem that the results are never the same twice, even for the same species. 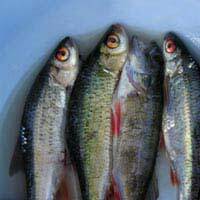 When dead baiting for pike, sections of sea fish such as mackerel or entire sardines and other smaller whole fish tend to be very popular choices, largely because of their strongly attractive smell. The method is not without its potential problems, so you need to be aware of the danger posed to pike by deep-hooking and position your hooks accordingly and stay vigilant on the bank to strike early and prevent the bait being sucked too far down. Bear in mind that the pike usually swallows its prey head first and you shouldn’t go wrong with the deep-hooking issue. Treble hooks anchored near the tail of your bait – or at the other end from the head, if you’re using the front half of a fish – are probably the most effective way of guaranteeing those vital extra seconds to detect the bite and strike before the whole thing disappears down that pike’s throat. Don’t be too enthusiastic over your size of hook – nothing bigger than a size 6, for example, on a four-inch bait should also ensure the optimum compromise between catching capacity and fish stock conservation. The basic technique for using dead baits involves fishing them on the bottom, where dead and dying fish naturally occur and predators are used to finding the occasional easy meal. This type of fishing is rather slower than other ways of catching pike, which has lead inventive anglers to devise all kinds of tricks to make the bait more attractive and so hopefully boost its chances of catching something big. Adding flavours is one approach that has been tried extensively and seems to be as effective as it is popular – though just as the over-use of a particular dead bait can cause the pike to become wise to what’s going on, always using the same smell and taste can make them wary too. Fish oils such as cod liver oil or pilchard oil are commonly used, mimicking the natural flavour of the prey and extending the distance over which the pike can sense the bait. Added colours too sometimes seem to produce good catches, presumably by making the bait more conspicuous. The use of bobbing and “pop-up” baits is another means to make things look more tempting and many anglers swear by the method. The idea is to increase the buoyancy of your dead bait slightly, so that instead of being a dead fish on the bottom, it appears to be a vulnerable, sickly fish – and few things attract a predator quicker that the prospect of prey that can’t put up a fight! It is possible to inject air carefully into whole fish to achieve this effect, but obviously this won’t work with strips or half fish, so attaching a float or wrapping the dead bait around a small piece of polystyrene will get the same result. It may take a bit of practice to get the amount of buoyancy just right, but it’s definitely worth persevering until you do. That said, don’t forget that it isn’t an exact science, so if it looks about right to you, it probably is! It’s not just pike that can be taken on dead baits. Suitably sized freshwater dead baits – such as bleak, minnows and small roach – can be used to tempt a range of larger fish, including barbell, chub, eels and perch as well as zander and catfish, where they are present. Seawater baits can also prove effective for large chub, with some anglers finding that strips of mackerel are particularly useful to lure them to the hook in waters with poor visibility. Dead bait fishing is a technique that seems to have been designed to tax the brain of the most inventive angler – there’s always something new to try and a better method to develop – but when it does all come together, there’s not much more satisfying. That and the fact that it can catch you some big fish too!